● 24hr SALE! ONLY A DAY! ● "Rated 4 out of 4 ... the best of its kind at the crowded App Store" - USA TODAY The top selling fitness app of all time has returned! Becoming and staying fit has never been easier with the help of Full Fitness! 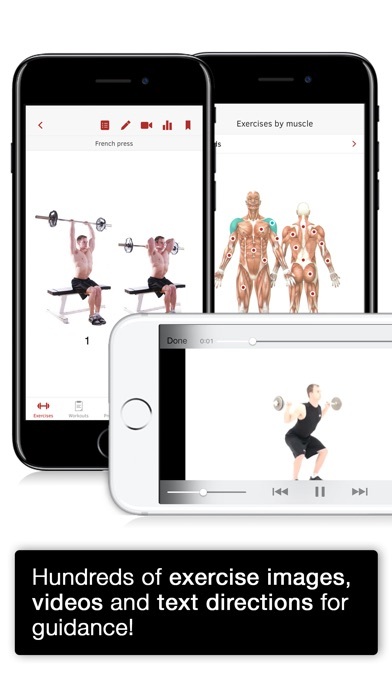 Hundreds of exercises are explained with clear pictures, videos and text instructions all within the palm of your hand! We understand personal trainers can be costly, but changing your workout routine is essential for keeping your body from growing accustomed to the same old exercises. If anything, adding some variety keeps things interesting and enjoyable - making it more likely that you will stick with the program. For under the cost of a cup of coffee, Full Fitness not only provides instructions for hundreds of exercises, but it sorts them by body region, muscle of target, and the equipment needed. Use our easy-to-use exercise builder to create your own custom exercise routine, and then track your progress as you perform each exercise. Full Fitness allows you to log your exercises, view progress graphs, and email or backup the results online. Not sure which exercises to perform? Use one of our 30 pre-defined routines to reach a particular goal. All of our routines are developed by licensed fitness professionals and come with complete instructions. If you have no equipment available, or are more interested in cardio or stretches, Full Fitness has you covered! 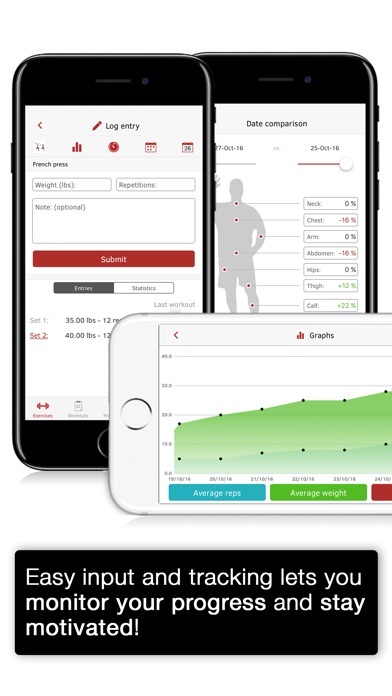 Tracking of cardio exercises, over 40 stretches and exercises and routines that require no equipment are all included! Full Fitness does even more. 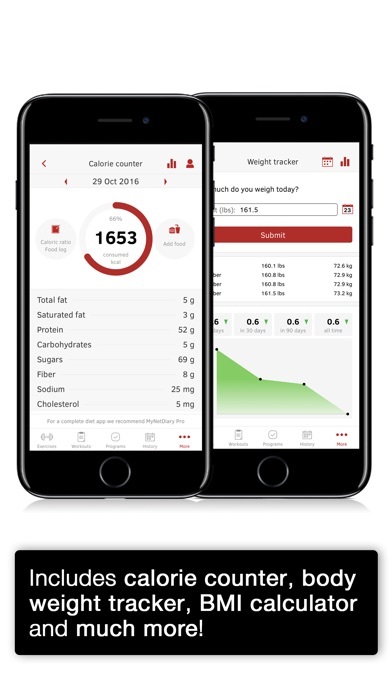 Track your food intake and body weight, schedule workouts, setup profiles to track more than one user, and more. This is the intuitive and beautiful fitness app you have been looking for! 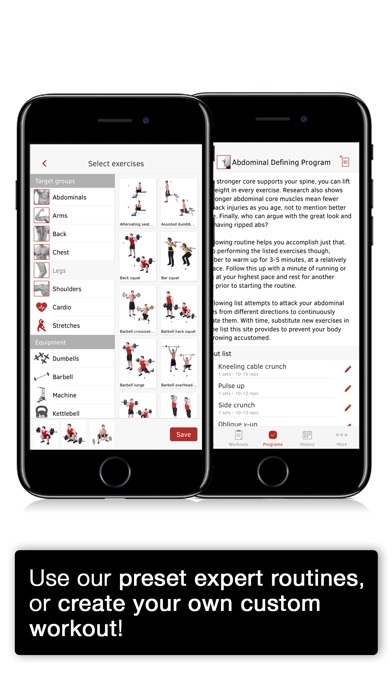 FEATURES ● hundreds of unique exercises (more than any other app) ● clear images of people doing every exercise with full text instructions ● hundreds of video instructions for many of the more complicated exercises ● calorie tracker with over 90,000 food items ● cleverly designed logging feature to record and track each exercise ● ability to add your own exercise and track your progress ● exercises ordered by target (abs, arms, back, etc), muscle they target (deltoids, biceps, etc) or equipment they require (swissball, kettlebells, nothing, etc) ● 30 routines to reach various goals (weight loss, strength, ab definition, golf program, etc) ● ability to email your workout logs to yourself, back them up online or view them on the device ● graph your workout results to give yourself the encouraging boost you need ● stop-watch timer to keep track of your rest times in between sets ● weight monitor/BMI calculator and measurements tracker to view your progress ● schedule your workouts ahead of time so you never forget your workout routine ● ability to track MULTIPLE users ● iCloud support and the ability to import content from Full Fitness or original iFitness app ● workout sharing tool to share your workouts between other Full Fitness users Unlike other fitness apps, everything is included - we do not believe in in-app purchases. Further, we are dedicated to providing regular free updates. The next update is under development. Write in and let us know what most interests you. There’s several small things that make the app not worth it. First off the dates in the graph are messed up, the month is in the date place completely messing it up. It goes day/month/year when it should be m/d/y. Second there are some workouts that are missing in the app, an option to add or create your own block would be very useful. It just needs overall more work to make it more user friendly. It has a list of workouts for every muscle, videos of people doing them correctly and what specific part of the muscle they’re working out. Keep in mind, it’s up to you to create a routine but it’s a great reference.